According to Evolutionists, Stone Age Homo Sapiens existed for 190,000 years before beginning to make written records, between the timeframe of 4,000 to 5,000 years ago. Prehistoric man was able to built megalithic monuments, made beautiful cave paintings, and kept records of lunar phases. It would seem improbable that mankind would have waited thousdands of centuries before using the same skills to record history. 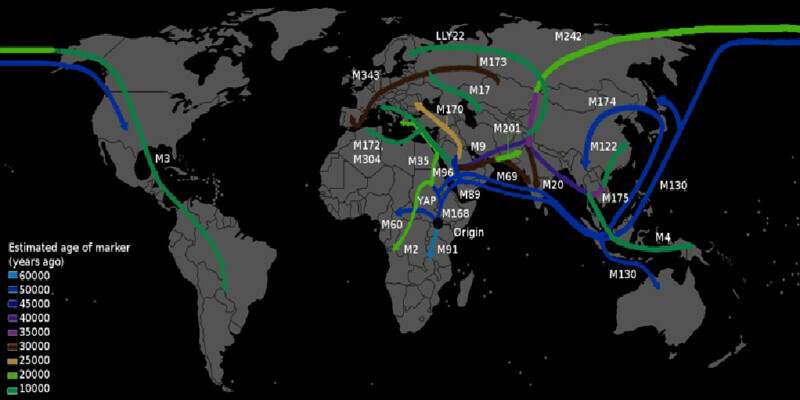 This map shows an the estimated migratory progress of human homo sapiens and their origination across the earth. Even though the timescale is based off an evolutionary time scale (see Fig.1), this data reflects the evidence; which would suggest that the origin of humanity began in the Middle East, then spread out to the rest of thew world just as recorded in the Bible. Knowing that humanity originated from this central location, the evidence also contradicts evolutionists own opinion of the data; as their long years still only give them an upper age of 100k years before they ‘run out of time.’ If homo sapiens evolved 200k years ago, why did it take an additional 100k years to spread out from this central location. The population rates during that 100k years would have been astronomical in this area and there is no archaeological evidence to support such a dense population. This evolutionary chart (Fig.1) would best fit the historic timeline when reduced by a factor of x10, with humanities start at roughly 5-10k years ago, right after Noah’s flood. Historians date the historical account of Abraham to have occurred around 2000 b.c. based on clues found throughout Genesis chapters 11 – 25. All of Abraham’s life and events encompass a journey that start in a place call Ur, one of the great cities in Sumer and a fertile crescent located from Tigris river to Euphrates. Historians call this era the ‘Dawn of Civilization’ because it marks the earliest documented dates when people settled in communities and began to document their progress in writings, agriculture, and commerce. The Biblical time scale is much more likely the accurate time scale as it takes into account all known historic time scales and matches up with all of recorded human history within a reasonable tolerance. It is also note worth to mention the fact that the Bible is the only article in our civilization that has everything recorded history from the beggining of human existence (including the universes beginning), through present times, and continues on to recored the events that will happen at end of time. Dritt, J. O., Man’s earliest beginnings: discrepancies in evolutionary timetables, Proceedings of the Second International Conference on Creationism, vol. II, Creation Science Fellowship (1991), Pittsburgh, PA, pp. 73-78, order from http://www.icc03.org/proceedings.htm.